MYRTLE BEACH, S.C. – Freshman pitcher Ashley Rogers spun a gem of a shutout in the Kickin’ Chicken Classic as #8 Tennessee blanked Boston University, 4-0, on Saturday night. Rogers threw a career-high 13 strikeouts and allowed just three hits through 7.0 innings of work to earn her second win of the season. In two appearances (12.0 IP), the Athens, Tenn., native has fanned 22 batters. Offensively, six Lady Vols recorded hits and four drove in runs. Two of Tennessee’s runs came in the first inning while the other two were spread across the second and seventh frames. Aubrey Leach kicked things off in the first, singling to center field. She advanced to third on back-to-back putouts and scored on Ally Shipman’s single to shortstop. Amanda Ayala then worked the count and reached base via a walk before coming home on Kaili Phillips’ RBI-single to right. To start the seventh, Kaitlin Parsons singled back to BU’s pitcher and advanced to third on the subsequent throwing error that sailed past the first baseman. The Long Beach, Calif., native scored on Leach’s RBI-groundout to the right side, pushing UT’s lead to 4-0. In addition to Roger’s 13 strikeouts, she faced the minimum number of batters in four of her seven innings pitched. The Lady Vols also never allowed Boston’s three runners to advance past first base. 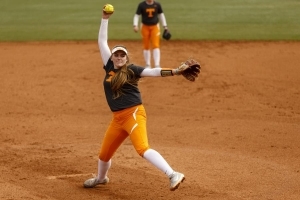 WHAT A GEM: Ashley Rogers’ 13-strikeout outing versus Boston is the most by a Lady Vol pitcher since Caylan Arnold also threw 13 vs. Charleston Southern on March 3, 2018. UP NEXT: Tennessee is set to take on Rider at 11:15 a.m. ET on Sunday to close out the Kickin’ Chicken Classic. Game times may differ due to the length of games earlier in the day, but any updates to game times will be posted to Tennessee’s social media accounts.